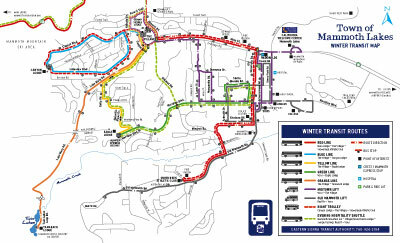 Mammoth is famous for its Red Line, Blue, and Yellow line community buses. The free transportation shuttle buses from the town up to the three different ski areas run on a regular schedule during the winter months. The stops in town are clearly marked and during the hours that Mammoth Mountain is open the buses run about every 15-20 minutes. During the evening hours they run less frequently until the late hours when they run until the bars and restaurants close. The Red Line goes from town to the Main Lodge, The Blue Line circles the Canyon Lodge area, and the Yellow line follows along Lake Mary. The former Orange Line doesn't run regularly. During summer months, the schedule is modified, however it is augmented by the new Trolleys and other local transportation. Click the map for a full size Mammoth Free Shuttle, with red lines, blue line, green line and orange line pick up locations.